Documentation in pulmonary rehab or respiratory services must provide evidence of medical necessity for each patient’s participation. Documentation must also provide evidence the patient is showing progress toward established goals with reassessment of that progress every 30 calendar days. The CMS regulation for pulmonary rehabilitation requires documentation of physician involvement with each patient, including direct patient contact every 30 calendar days. In addition, there must also be documentation of an outcome measurement for each patient, with recommendations for measurement in the areas of physical function, dyspnea, and quality of life. The purpose of this activity is to provide the learner with the knowledge required to meet the standards for documentation and outcome measurement within a pulmonary rehabilitation or respiratory services program. This course is appropriate for anyone in a health care discipline involved in development of pulmonary rehabilitation program, as well as program staff working in an established pulmonary rehabilitation program but who is new to the field of pulmonary rehabilitation. It would also be appropriate for any pulmonary rehabilitation program staff interested in a review course on the various components and billing in a pulmonary rehabilitation program. Describe documentation requirements for pulmonary rehabilitation. Explain communication with the referring physician. 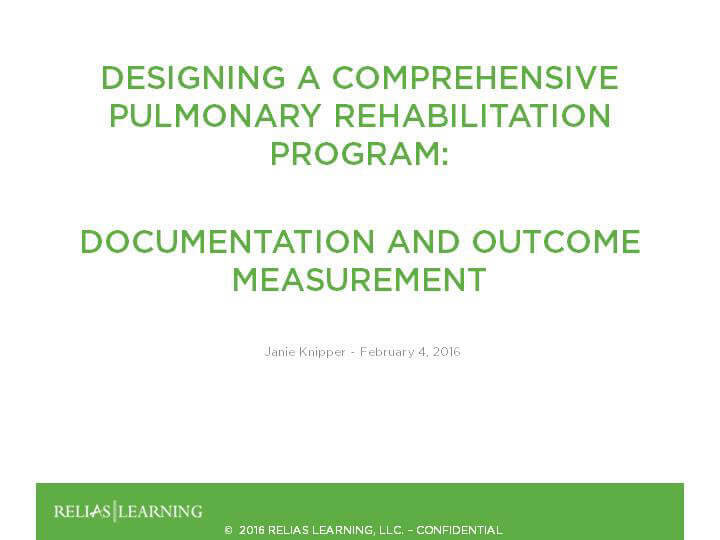 Describe measurement of outcomes for participants in pulmonary rehabilitation or respiratory services programs.